Chicago Cutlery Reviews – Which Knife Sets Are The Best? We have already gone through the best JA Henckels knife sets together, and today we will take a look at some of the best Chicago Cutlery knife sets, which are known for their affordability. So let’s get started with the Chicago Cutlery reviews! As an American enterprise, Chicago Cutlery is famous for its different styles of knives and block sets available as an inexpensive alternative to costly German steel. These products appeal to anyone who wishes to have every type of knife in the kitchen for having a full matching set, which is otherwise quite a costly affair. 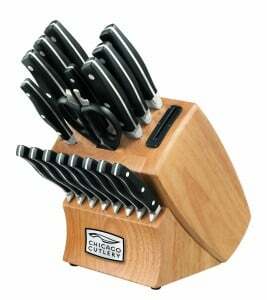 With Chicago Cutlery, you can have cheap yet quality knife sets. As usual, I’ve compiled a neat table to present you the most popular knife sets by this company. You can sort the columns by clicking on their header area. If you are fond of one-piece design, kitchen knives set by Chicago Cutlery are bound to please you. Although they are made in China, you will never be disappointed in terms of aesthetics and construction. They are pretty good looking, solid knives with handles of stainless steel affixed to the blade to form a single piece, ensuring easy cleaning. These knives also come sharper than most other competitors thanks to which they cut the toughest foods easily. However, you will need to maintain the edge with the included sharpener. Although these knife sets may not be exactly not on par with those in utilization by professional chefs, they are admired for superb quality for home use. There are many block sets available from this maker but the search lies in finding the best one. I have gone through countless of Chicago Cutlery reviews to select some of the best Chicago Cutlery knife sets for you to choose from. As always, they are not listed in any particular order. This one combines sophistication, quality, and usefulness for facilitating a variety of tasks in a modern kitchen. It comes with 18 knives, each having a particular use, such as a 7.75-inch chef, 3-inch peeler, 5-inch utility, 5-inch Santoku, 3.25-inch parer, 8-inch slicer, 8-inch sharpening steel, and 5-inch Partoku. The design of the block is such that the knives gel well with the rest of the items in a modern kitchen. The knives feature a black handle and a shiny, forged stainless blade that prevents staining and rusting. The forged material ensures non-sticky surface, easier cleaning, and prevention of succumbing to the pressure due to high humidity. The blades are also resistant to chipping due to longer usage and re-sharpening. The set also comes with taper grind edges for secured and accurate cutting. This is essential for cutting consistent pieces of vegetables and cheeses. The block set also comes with a sharpener rod for sharpening the dull edge after heavy use. If you guard, sharpen, and clean the blades carefully, you enjoy the lasting quality of these knives. The poly black handles are smooth to touch and are resistant to bruises, regardless how long you use. They are also composed of strong plastic for solid grip to cut safely. The handles are also dishwasher safe although a hand wash is more preferred. You can consider this set for professional performance in daily cooking. Click here to get the Chicago Cutlery 1119644 knife set on Amazon! This set is designed for anyone who loves to cook professionally on daily. It comes with 19 pieces including around 15 different knives that are professionals’ choice for efficient and precise preparation in the kitchen. With stainless steel build and satin finish, these tools are soothing to both hands and eyes. The specialty of this set is that it comes with a block having not only knives but also a sharpener and cutting boar of wood. 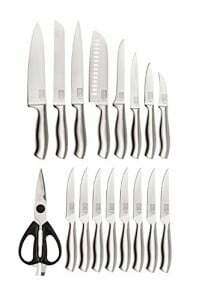 This Insignia set comes with a 3-inch peeler, 8-inch serrated bread, 3.25-inch parer, 5-inch utility, 8-inch slicer, 7-inch Santoku, 6-inch boning, 8-inch chef, and 8 4.25 steak knives along with shears. All these knives are built from high-carbon 440A stainless steel. However, the steel forged blades are resistant to stains and rusting although they are prone to discoloration. Further, this steel makes them shinier and softer than 440HC. The softer part cuts down the sharp part a bit. However, they are easier to maintain and come with optimal sharpness and precision lasting for a lifetime. The exclusive taper-edge grind ensures extreme sharpness out of the box. Further, the full metal tang facilitates more stability as well as control. Even the handles are in steel and give good comfort. Click here to get the 19 Piece Knife Block on Amazon! This is another elegant set to consider for your kitchen, which acts beyond an essential kit. The Belden series oozes a trend-forward design famous for its curved handles, sophisticated styling, and angled bolster showing genuine impact on the kitchen counter. 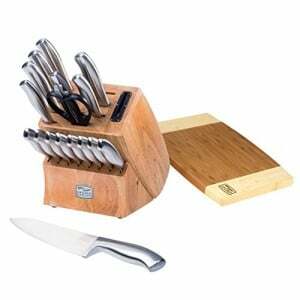 The set comes with a block in unique cherry wood finish, six 4.5-inch steak knives, 5.5-inch utility knife, 3-inch peeler, 8-inch chef knife, 8-inch slicer, 8-inch bread knife, two 4-inch paring knives, and shears. There is no Santoku or sharpener includes, unlike the aforementioned sets. Forged knives have blades with full metal tang and taper grind edge for ideal precision, optimal sharpness, and great control and balance. All blades are made up of stainless steel that keep all stains and rusts away for long, while triple-rivet polymer handles are light and comfortable. 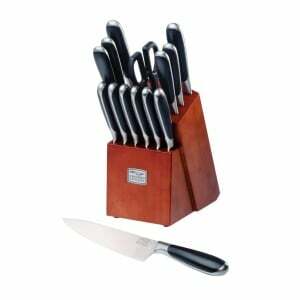 Click here to get the Belden 15-Piece Block Knife Set on Amazon! 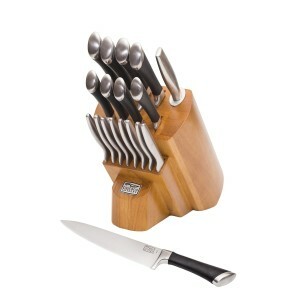 This 13-piece set features exclusive knives whose blades are built using high quality Japanese steel. This material renders not only strong but also sharp edge for a pleasant experience of slicing and cutting. In fact, the sharpness lasts longer than what you might have expected. In terms of durability, this steel also does not disappoint you. The blade is such that it can slice via the crusted blade without forming a mess. The handle is another distinct feature, as it is highly innovative to ensure superior grip as well as comfortable. This allows cutting without fatigue. Their grip is great, as there is hardly any chance for the knife to fly in air suddenly, while cutting. The set comes with all-purpose 8-inch chef’s, 8-inch bread, 7-inch Santoku, 5-inch scalloped utility, 3.5-inch parer, 4 4.25-inch steak, and a pair of kitchen knives along with a wooden block. The wooden block is superb and oozes a tone of sophistication. The tapered beveled edge of the set is stylish and safe to use. 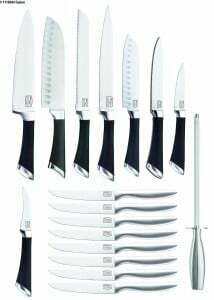 Click here to get the Chicago Cutlery 1109176 DesignPro Knife Set on Amazon! 8-inch slicer, 8-inch chef’s, 8 4.5-inch forged steak, 3- and 3.5-inch parer, 5.5-inch utility, 5-inch boning, 7-inch Santoku, 7-inch serrated bread knives. It also includes sharpener and shears. The knives are built using the stainless steel featuring high carbon footprint for more strength and increased durability. The high-carbon stainless steel helps in resisting stains as well as rust for lasting good looks and effortless maintenance. Further, the full tang tends to boost both performance and balance. This product also comes with triple steel rivets for protecting the section from handle to blade as well as ensuring stability. The black polymer handles ensure comfortable grip. Click here to get the Chicago Cutlery Insignia2 Knife Set on Amazon! The aforementioned knife sets from Chicago Cutlery might look the same but each have some distinct point that can help you in making the right selection. If you are on a strict budget, you can consider any of the above sets. However, this is applicable only if you do not mind some miss in workmanship. Still, you are getting full lifetime warranty. 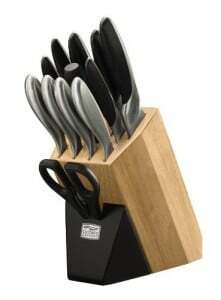 In short, these knife sets are affordable such that most families can think of buying them, which is commendable.